Thanks to film editor Charles White for sharing this document, and for keeping it safe since 1987! 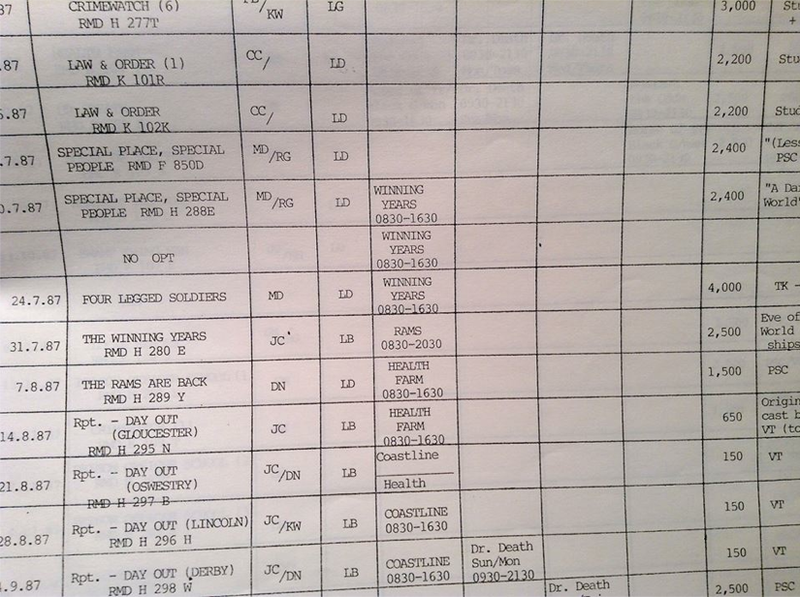 This document shows the allocation of regional editing suites in summer 1987. The programmes listed are the regional opt documentaries. These were weekly, 30 minute programmes about all sorts of subjects of interest in the Midlands. They included regional versions of shows like Crimewatch. The standard editing day seems to be 8.30-16.30. Each programme had a separate programme number, which is shown under the episode title. The final column shows how the programme was made e.g. studio, PSC (portable single camera), TK (film transfer), VT (videotape editing).